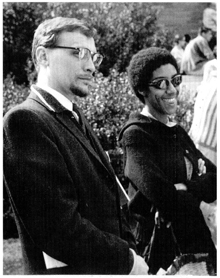 Hatch and Billops on the UCLA campus, where they met as students, in 1960. Emory University and the Manuscript, Archives, and Rare Book Library (MARBL) will host “Mama and Papa Lala: 30 Years of Billops-Hatch Films,” a free retrospective and symposium, on Thursday, Oct. 2, and Friday, Oct. 3, at the Robert W. Woodruff Library and White Hall on the main campus. Camille Billops and James Hatch have collected and documented African American culture and artistic history for more than 40 years. The pair has produced and directed six films since 1982 that explore race, class, gender and history. Their most recent project, “Mama and Papa Lala,” is a documentary that traces their path as partners, lovers and friends, illuminating their shared familial, creative, emotional and cultural lives. The couple placed their archives at MARBL in 2002, and the collection is available for research use. The program at Emory will feature screenings and discussion of all six Billops-Hatch films, starting at 3 p.m. Thursday. That evening will include a keynote talk by Princeton scholar Valerie Smith, whose pioneering scholarship brings critical feminist thought to her literary, film and media studies. Friday's screenings will include vintage home movies shot by Billops' mother, Alma Dotson, offering a glimpse into everyday life for a black family living in California in the 1950s. The event will conclude with a sneak preview of footage from “Mama and Papa Lala” and a conversation with Billops and Hatch. The program is curated by Emory alumna and film scholar Miriam J. Petty, an assistant professor in the School of Communication at Northwestern University. A small exhibit related to the films, called “There's Nobody Coming for Us but Us: Prints by Camille Billops,” curated by graduate student Clinton Fluker, will be on view on Level 2 of the Woodruff Library. 10 a.m.: Screening of “Take Your Bags” (1998, 11 min.) and “The KKK Boutique Ain't Just Rednecks” (1994, 60 min.). Comment by Louis Massiah, Scribe Film and Video Center. The Camille Billops and James Hatch Archives at Emory University consist of materials relating to African American culture and art. Billops, a film maker and artist, and Hatch, a theater historian and scholar, built the collection over the past 40 years, and some of the material dates back to the late 1870s. The collection includes a large selection of published and unpublished play scripts written mostly by African American playwrights, as well as posters and artwork. It also includes nearly 3,000 rare books and an extensive periodical collection. The couple conducted oral history interviews, included in the archives, for use in Artist and Influence, a journal they published starting in 1981. There are also materials relating to African American theater and printed material relating to dance. The photograph series contains images of African Americans in movies and plays; as well as individual publicity shots of African American actors and images of African American musicians and bands. Parking is available for the Oct. 2-3 events in the Fishburne and Oxford Road decks. For more information, contact Julie Braun at jkbraun@emory.edu.